Where to meet people in the Island of Fernando de Noronha. 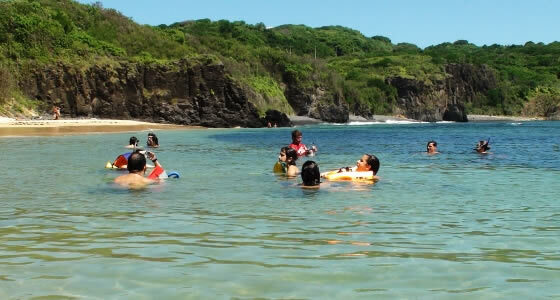 Learn where to meet people in the Island of Fernando de Noronha. The natives of Fernando de Noronha are very warm and friendly. Many home owners have converted their homes into charming inns to let it out for tourists. In all such inns tourists find family members around the common dining table. The guides, buggy drivers are all usually very friendly people. The population of Fernando de Noronha is so less that you won’t be surprised to bump into the same people several times during your entire stay on the island. The Antonio port is a great place to meet people. The Port is almost always abuzz with people because of the tourist boat rides and is the place for loading off goods that are shipped from the mainland. Sancho Bay, Atalaia Bay and Porcos bay are some of the beaches where the crowd is more compared to other places. During the local carnival many people from the mainland visit Fernando de Noronha to participate in the carnival, so it is an ideal time to get to know the Brazilians if you aren’t a native of Brazil. The islanders too mingle very well during this jubilant time. The bars and restaurants which mostly scattered around the island are good places to visit and get to know more about the island. The bars usually are very lively with Brazilian music playing in the background. ‘The Dog Bar’ is a great place to visit other tourists who love to hang out in this watering hole and groove to samba music.